Double Chocolate Cookie Truffles an easy and delicious homemade chocolate truffle recipe. Made with vanilla wafers, white and milk or dark chocolate, ground nuts or coconut. The perfect no bake after dinner treat. 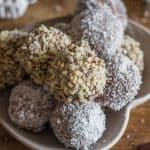 I have a few homemade chocolate recipes including Easy Homemade Filled Chocolates that we all love and needless to say these cookie dough truffles are becoming a fast favourite. With Valentine’s Day just around the corner and Easter not far behind I thought an Easy Chocolate Truffle would be perfect, especially a no bake double chocolate recipe. AND YES IT IS TIME ONCE AGAIN FOR OUR MONTHLY TASTE CREATIONS BLOG HOP, AND FOR THIS SPECIAL MONTH OUR FOOD IDEA IS Chocolate as a Gift Idea. How to make Chocolate Cookie Truffles. Ground 1 package of Vanilla Wafer Cookies. Melt the white chocolate either in the microwave or I find it easiest to break it up and place it in a dish over a small pot of boiling water (make sure the water doesn’t touch the plate). Make sure to freeze the mixture and the formed balls, so they are easier to handle. Use a toothpick to dip your truffles in the melted either dark chocolate or milk chocolate. Ground your choice of nuts, I used almonds, but hazelnuts, walnuts or even pecans would work or even coconut if you prefer. 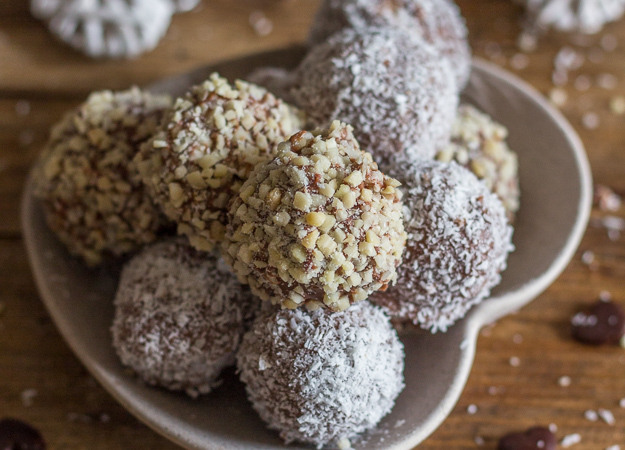 Refrigerate the Chocolate Cookie Truffles at least one hour before serving. A head of broccoli or a bag of fresh picked chicory is just as romantic in his opinion! So I guess if I want chocolate I better make it myself! More Chocolate Valentine’s Day Recipes you may enjoy. So whether you celebrate or not Valentine’s Day, either with Chocolate or Broccoli, I hope it’s yummy. Enjoy! 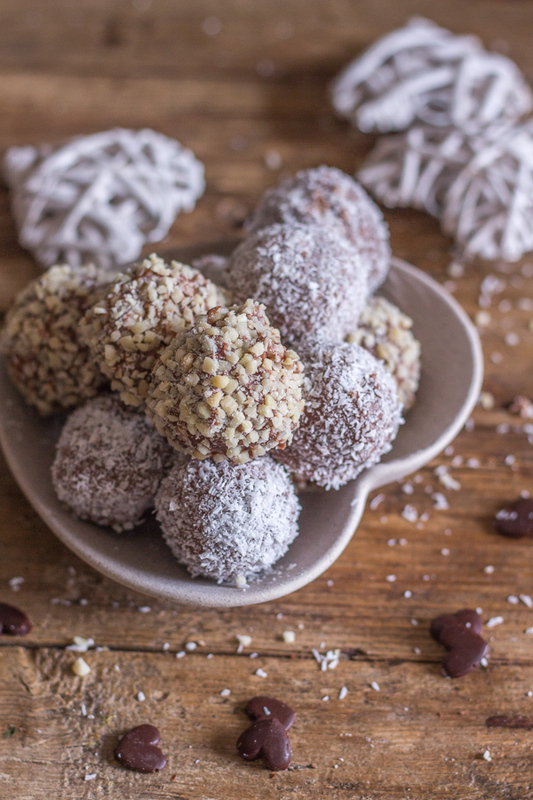 Double Chocolate Cookie Truffles an easy and delicious homemade chocolate truffle recipe. Made with vanilla wafers, white and milk or dark chocolate, ground nuts or coconut. The perfect after dinner treat. In a blender finely ground the wafer cookies. In a medium bowl add the crushed cookies, and the melted white chocolate, mix to combine well. Place in a glass bowl, cover with plastic wrap and freeze for approximately 10-15 minutes or until firm but not frozen. Remove from the freezer and using a teaspoon remove a heaping spoonful, and form into a ball. 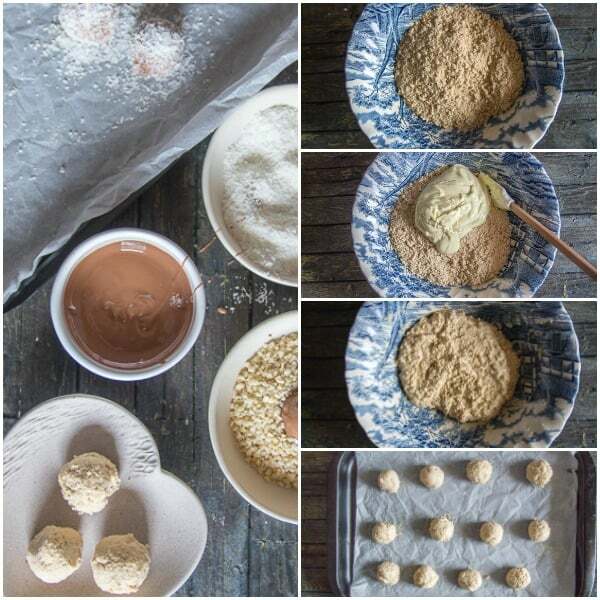 (Place balls and mixture in the fridge if they become too soft). Once all the balls are all formed then place the cookie sheet in the freezer for another 30 minutes. 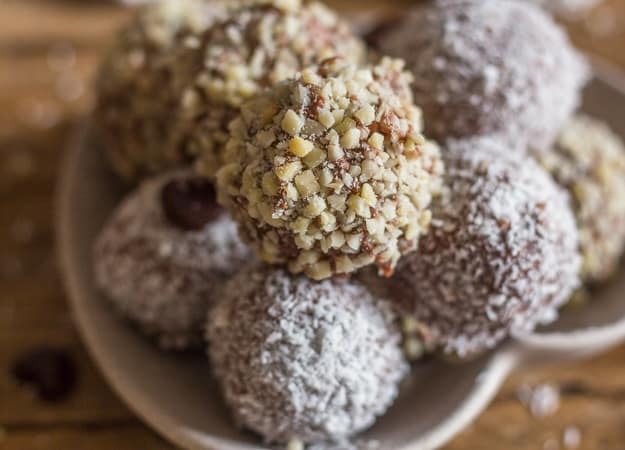 Then remove from the freezer and using a toothpick or fork dip the balls in the melted dark or milk chocolate and then roll in the ground nuts or coconut. Freeze the chocolates once again for 30 minutes before serving. Enjoy! Ooh those look absolutely delicious! My husband would love these, and I think I’ll make them together with my daughters for him for Valentine’s day. thanks for the recipe! Hi Nikki, thanks so much I hope you enjoy them. These sounds amazing and I cannot wait to try them! Hi Terri thanks so much I hope you enjoy them.